Please click here for the Alegria® footwear size guide. Get ready to fall head-over-heels in love with comfort inducing Debra! Features a durable, stain-resistant leather upper that is easy to clean. Slip-on style with a lightly cushioned collar and dual gore strips at instep. Provides a roomy toe box for all-day comfort. Smooth and breathable leather linings. 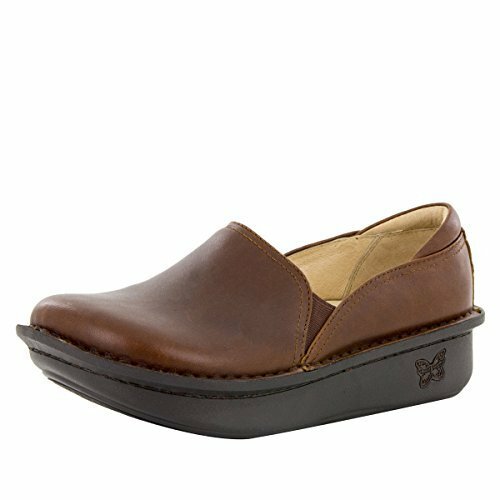 Offers a removable footbed made of cork, latex, and memory foam for all-day comfort and support. Durable and structured outsole aids in reducing stress on joints and muscles. Slip-resistant polyurethane outsole is crafted to promote a natural walking motion. Imported. Click here to learn more about Alegria outsole technology. Measurements: Heel Height: 1 1⁄2 in Weight: 12 oz Platform Height: 1⁄2 in Product measurements were taken using size 39 (US Women's 9-9.5), width Regular. Please note that measurements may vary by size.